Quick summary: In this Finding Out lesson, students will consider human rights and how they connect with the Australian Constitution. Students will share their opinions about the role of rules and analyse primary sources to better understand the Australian Constitution. They will explore the rights and freedoms addressed in the Constitution and critically assess the human rights that are not enshrined in the Australian Constitution. They will research sections of the Constitution, and share their findings with their peers. Then, using a visible thinking routine, they will reflect on their understanding. What is the connection between rights, freedoms and the Australian Constitution? What role do rules play in a democratic society? How is the Australian Constitution still relevant today? Critical thinking, communicating, team work, empathy, initiative, leadership, problem finding. Relevant parts of Year 7 achievement standards: Students explain how Australia’s legal system is based on the principle of justice. Students explain the diverse nature of Australian society and identify the importance of shared values in promoting a cohesive society. When researching, students develop a range of questions and gather and analyse information from different sources to investigate Australia’s political and legal systems. They consider different points of view on civics and citizenship issues. Students develop and present arguments on civics and citizenship issues using appropriate texts, terms and concepts. Resources required: Student Worksheet – one copy per student. Device capable of presenting a video to the class. The Constitution – Image. Printed copies of Closer Look: The Australian Constitution (produced by the Parliamentary Education Office), separated into four sections. The Australian Constitution – Chapter Summaries, Australian Constitution and UDHR Comparison Table (printed, enough for one per student), highlighters. Keywords: Human rights, Universal Declaration of Human Rights, Australian Constitution, rules. Overarching learning goal: Students will gain a better understanding of the Australian Constitution, including its content, purpose and jurisdiction. They will develop a better understanding of how the Australian Constitution protects our rights and freedoms. Students will develop an understanding of the rights and freedoms that are not protected by the Australian Constitution, who is affected by this, and whether the Australian Constitution could be altered to incorporate additional rights. Students will develop skills in research, critical analysis and constructing an evidence-based argument. Thought starter: We have come from many parts of the world yet we have many common values and principles uniting us. 1. 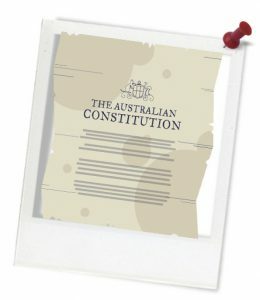 What do you know about the Australian Constitution? 3. 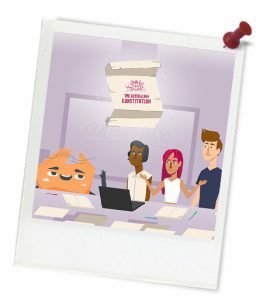 JIGSAW CLASSROOM – Finding Out about the Australian Constitution. Which Chapter/s of the Australian Constitution did you read about? 4. Linking the UDHR to the Australian Constitution.